The senior forward scored all three goals in the Rangers' title game victory. 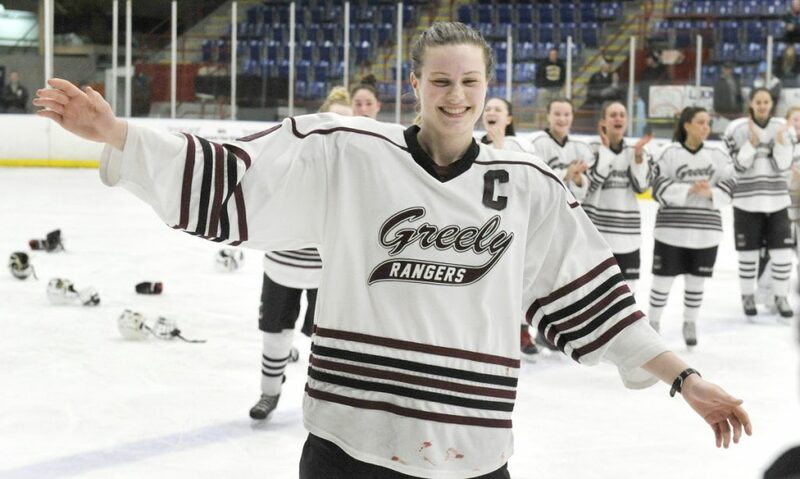 Greely High’s Courtney Sullivan has been named winner of the inaugural Becky Schaeffer Award, presented to the top senior in Maine high school girls’ hockey. Sullivan scored three unassisted goals for Greely/Gray-New Gloucester in its 3-1 championship game victory over Cheverus/Kennebunk on Feb. 17. Sullivan, a forward, led the Rangers with 68 points (47 goals, 21 assists) this season. Other finalists for the award were Greely forward Bridget Roberts, Cape Elizabeth/Waynflete/South Portland goalie Abby Joy, St. Dominic defenseman Katya Fons and Winslow/Gardiner forward Evelyn Hinkley. Sullivan was announced as the winner Wednesday night at the Senior Game at Family Ice Center in Falmouth. The award is named in honor of a former Yarmouth High player who died in 2011 at age 23 in Micronesia, where she was teaching. Schaeffer played for the Yarmouth boys’ team before girls’ hockey became a sanctioned sport by the Maine Principals’ Association in 2008.